Ladies Lake is located in the most stunning position in historic St Andrews in Scotland. 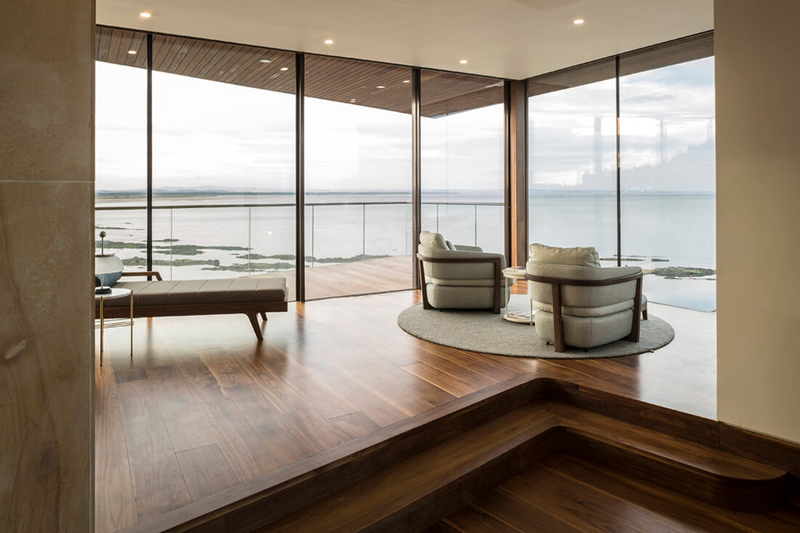 Invisible from the road it commands panoramic views of the bay encompassing views across St Andrews Castle and West Sands and Castle Sands beaches. 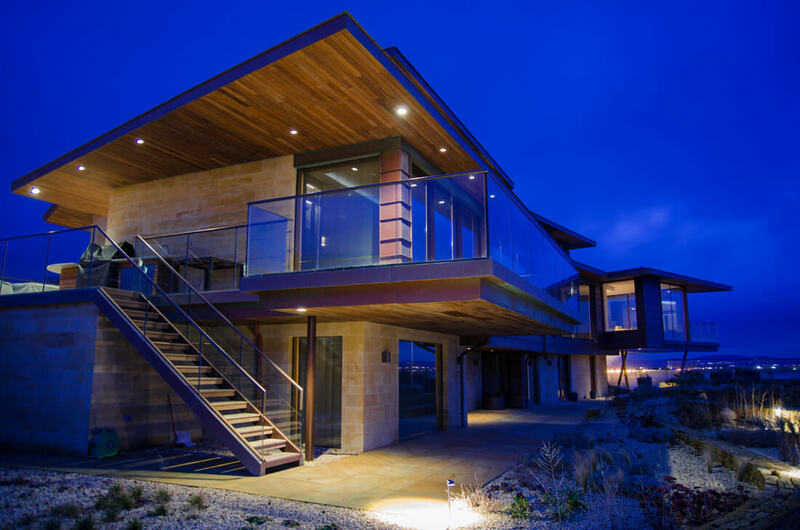 This multi award-winning project was recently awarded ‘Best Lighting, Control and Installation’ and shortlisted for ‘Best Integrated Home’ at this years CEDIA EMEA Awards, it also won ‘Best Whole Home Project’, again in the EMEA region at this year’s Control 4 ISE Awards. Designed by Andrew Black Design in Dundee, Ladies Lake also won the ‘Supreme Award’ at the DIA 2016 Awards in October. 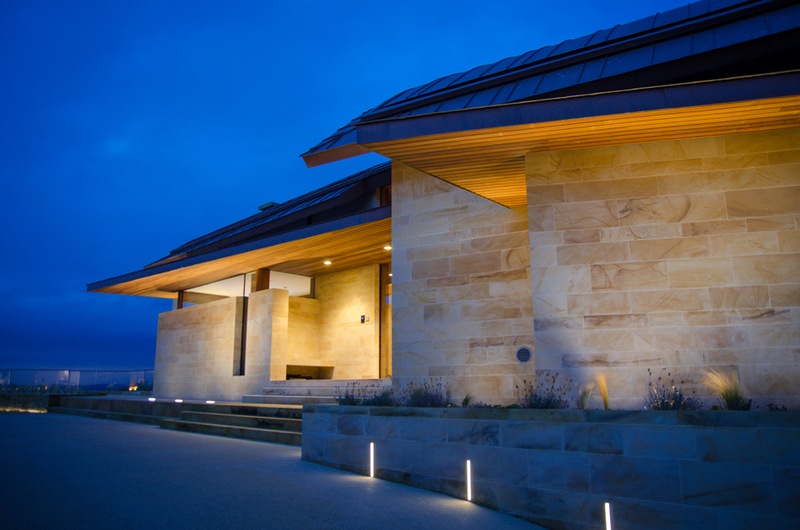 The bronze-clad house built in cut sandstone also took the awards for ‘Best New House’ and ‘Best Use of Stone’. 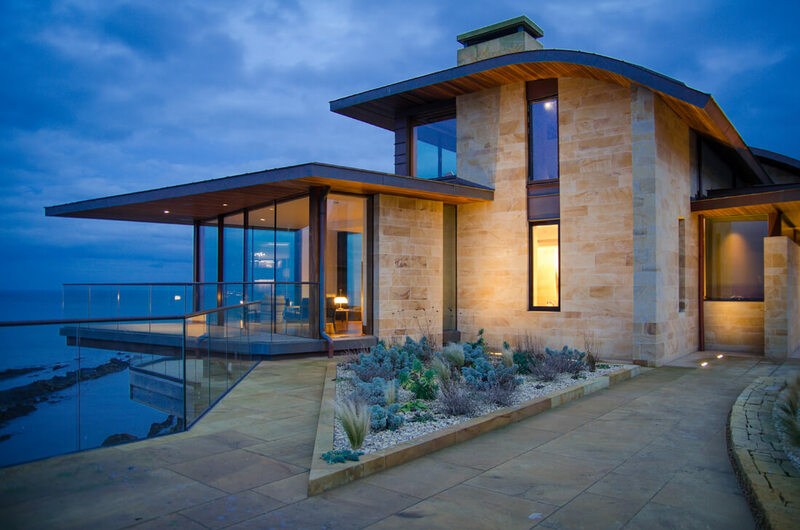 The inside is every bit as special as the outside, with sandstone walls and frameless glass giving sweeping views out to sea. 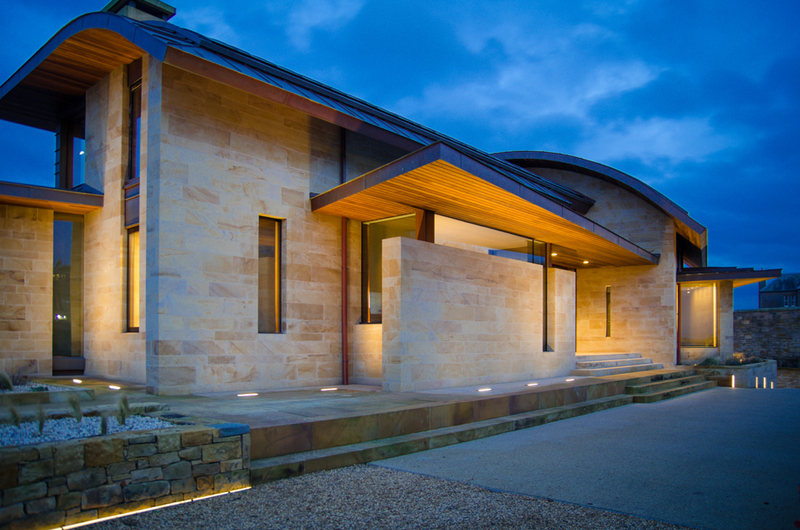 The Client was looking to create a holiday home that allowed them to have a base in their beloved St Andrews, where they enjoy golfing activities and the fabulous location. The owners wished to create a property that took full advantage of the situation, abundant coastal wild-life and local facilities, as well as to have a house that was hugely energy efficient, used all the latest products and methods across all disciplines, and create something unique. 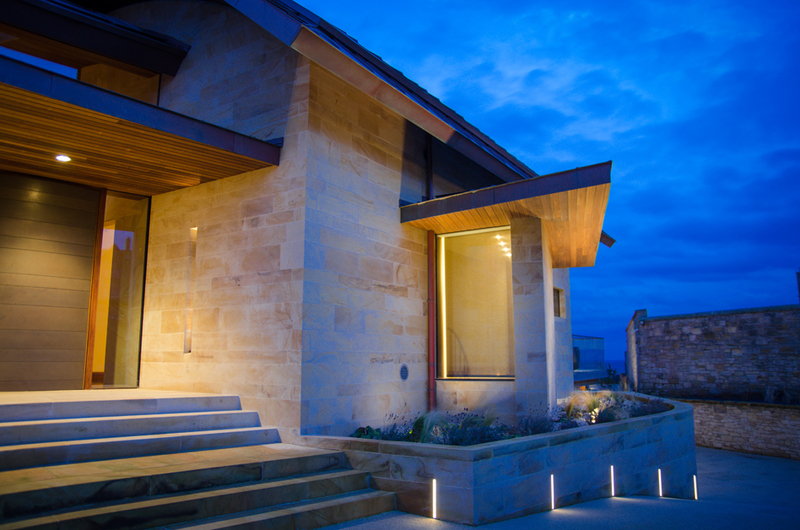 Due to the nature of travelling long haul to enjoy their property, the Client was very interested in the idea of ‘human centric lighting’. 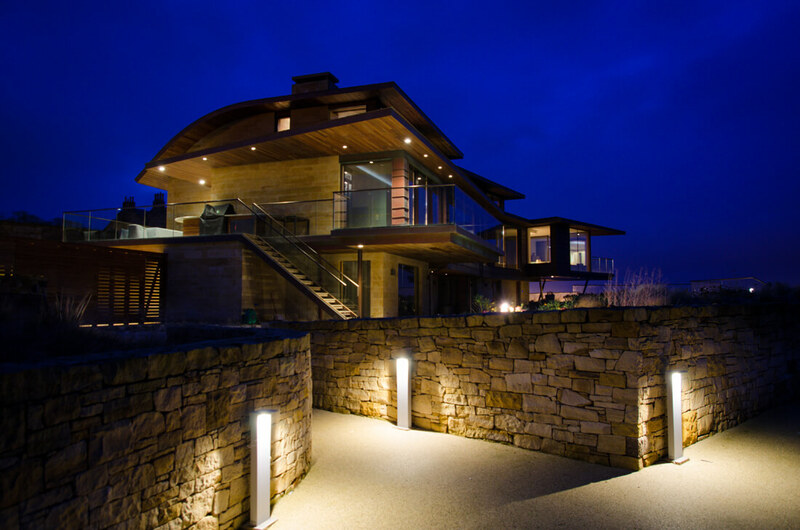 A unique dynamic lighting system was designed for the property that actually assists the owners to recover quicker from jet lag associated with each trip to Scotland from the US. We provided a complex circadian lighting system that mimics the natural sun’s light throughout the day in order to ensure the human biological rhythms are in tune at all times with no intervention from the Client. 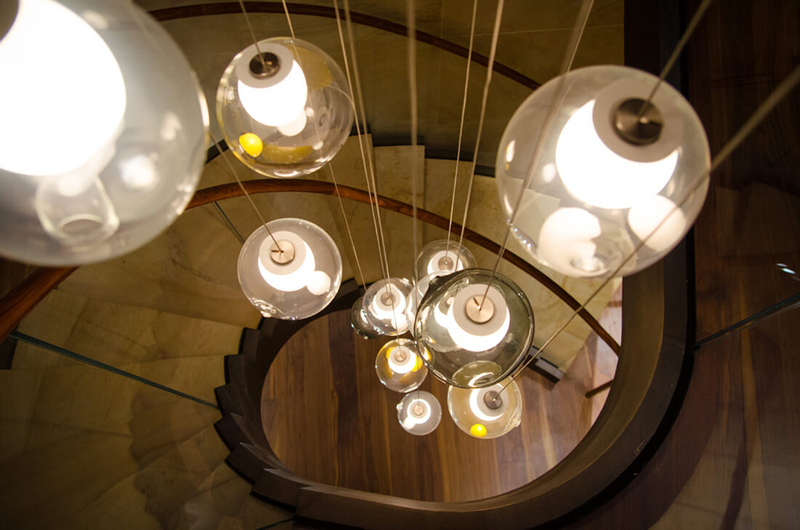 Using a bespoke set of drivers for Control 4, we integrated a hybrid set of DMX and DALI luminaires linked to an astronomical clock and our own dynamic lighting curve in order to provide fully synced internal lighting. 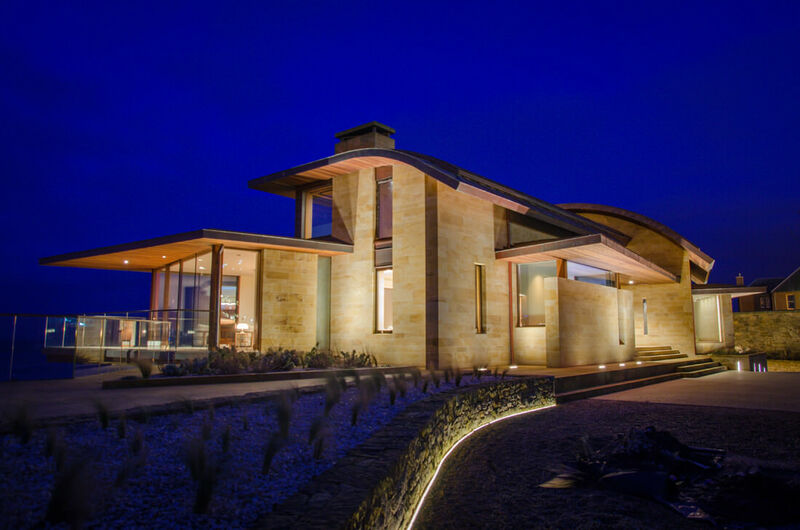 In addition, we were responsible for the design, supply and commissioning of the cutting edge architectural lighting systems for the entire property and grounds. 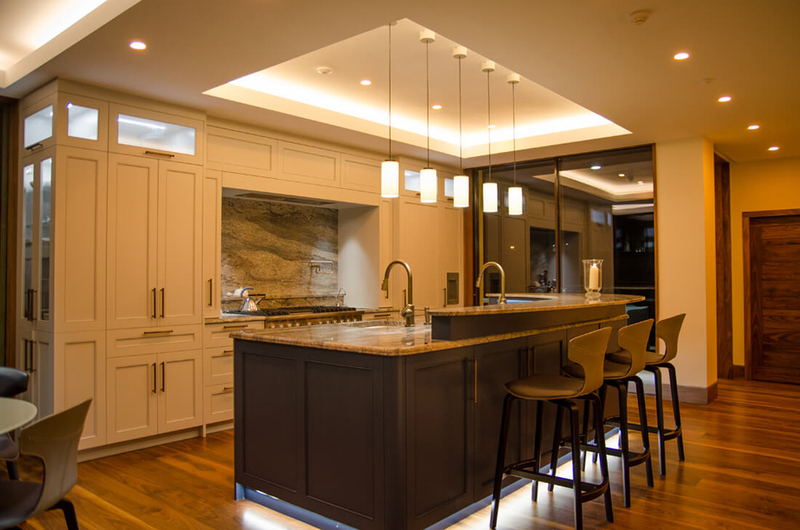 Incorporating a host of modern lighting solutions, the energy efficient, all LED system enhances the stunning architecture and interior designs. Integrating various control protocols into this property with the desire to ensure the building operated autonomously was a big challenge. Our AV and Lighting designs took Control 4 architecture to a new level as far as control of the audio systems and integration of cutting edge lighting systems and controls were concerned. Incorporating seamless control of multi zone audio and video systems, climate control inc integration of under-floor heating and mechanical heat recovery, blinds and curtains, complex lighting, discrete video monitoring and door access, a remote HD ‘wildlife’ camera, gate and door security controls, remote monitoring of the entire property, and all via a simple Control 4 user interface and app. The client achieves the simplicity of simple scene and level control, and Control 4 performs the complex work in the background. We believe that all audio should be tuned wherever possible to bring out the best of the music in all environments. Basic EQ was not sufficient for this project and part of the design brief we developed was to ensure that the music systems performed at their best. The biggest challenge was the insistence of the architect and Client to avoid visible speakers in the main entrance floor ceilings, so we were asked to design using invisible speaker technology, which has limitations in regards to loudness and dynamics across the low end frequency range in particular. The main living spaces featured Amina AIW750 HF & LF invisible speakers, and we needed to ensure that the best possible results were achieved sonically, so using a series of Dante linked Bose ESP DSP solutions, 32 band EQ was applied to all channels and all areas were tuned to suit the Client’s love of classical music. In addition, EQ’s were applied to the various B&W in ceiling speakers for bedrooms and bathrooms, as well as external Sonance speakers for the terrace. A total of 39 amplifier circuits. Ladies Lake was a 30-month project for Pyramid from initial consultation and design, through to installation and commissioning. Managed and installed by our in-house team of Engineers, we delivered our most complex and successful residential project in the UK to date. Working with the guys at Pyramid we were very quickly given confidence that they not only knew what they were talking about and had a great eye for detail, but most importantly understood that we as clients were concerned that technology for the sake of it was not what we were looking for at this property. We are very happy to report that the systems installed work seamlessly with the minimum of input from us and are easy to use and logical. Further to this, the house looks amazing with the excellent lighting, and we are looking forward to the benefits this innovative system will provide us in our new home. If you want to find out more about our residential or our lighting services then please do not hesitate to contact a member of our team!